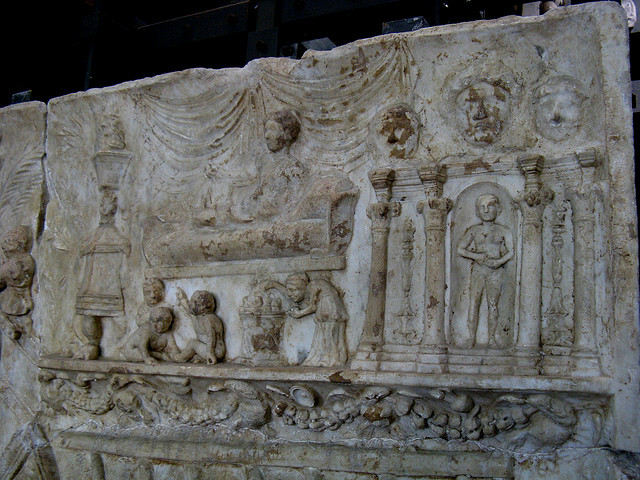 To say that the ancient Romans thought a lot about funerary ritual and post-mortem commemoration is an understatement. 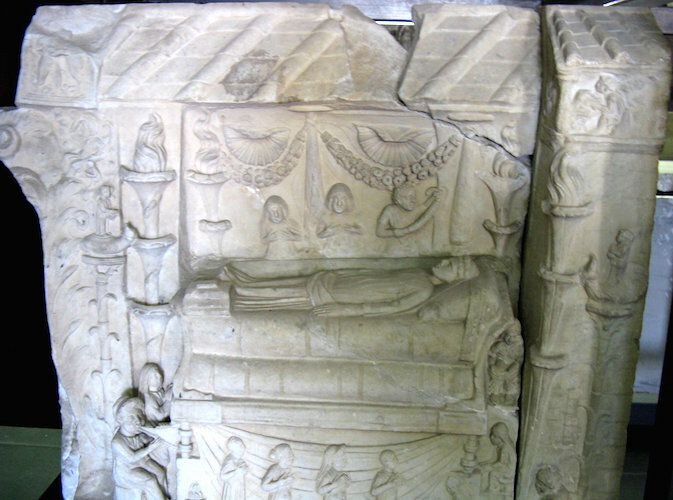 Abundant textual evidence records complex, performative rituals surrounding death and burial in ancient Rome while significant expenditures on visual commemoration—elaborate tombs, funerary portraits—defined Roman mortuary culture. 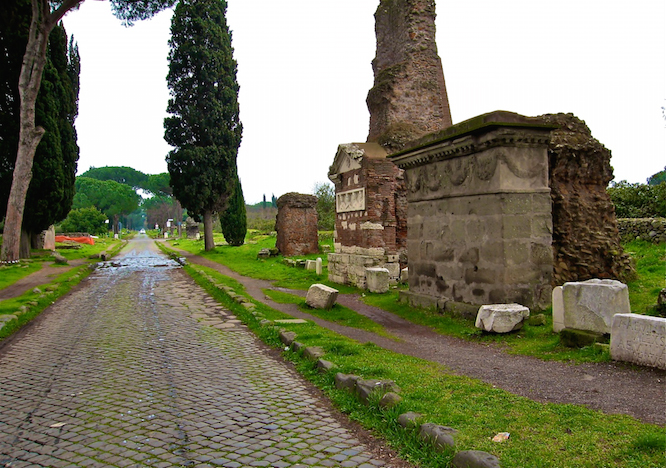 Cemeteries and tombs lined extra-urban roads throughout the Roman world so that the mere act of exiting or entering a city brought one into immediate and direct contact with the world of the dead. In fact, Roman funerary art was not marginalized within Roman visual culture but was an integral part of it and constitutes one of the largest surviving bodies of evidence of Roman art. Many conspicuous funerary monuments remain that commemorate the lives of elite Romans but members of other social strata also made sure to leave a lasting legacy and, indeed, funerary art is the only category of art that documents the lives of those outside of the elite. In ancient Rome, great opportunities for economic mobility existed and when people of the lower classes—former slaves (liberti) or members of a servile family—made money, they often wanted to commemorate their success by commissioning a tomb or grave marker that documented their rise to wealth. Two examples of surviving funerary monuments illustrate some of the these tendencies while providing a window into Roman funerary culture and art associated with freedmen and women, that is, people who were former slaves. The first example is a late first century B.C.E. 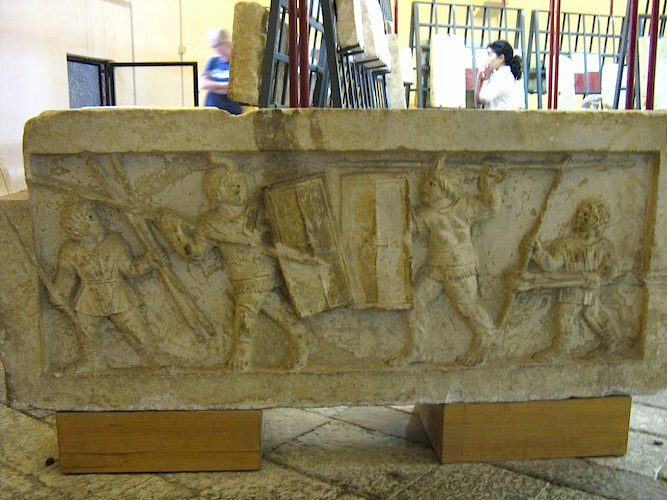 funerary relief from Amiternum (above), located in what is now the Abruzzo region of Italy. 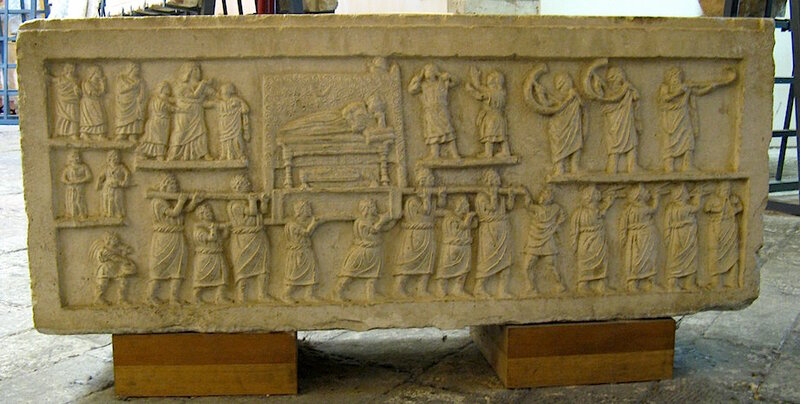 One relief depicts a person of some consequence and shows the only existing scene in Roman art of the pompa or funerary procession that was famously described by the historian Polybius (History 6.53-4). Roman funerals were often elaborate affairs that began in the house and culminated tombside. Upon death, dramatic displays of mourning were performed by household members of the deceased’s family. Such mourning rituals included wailing, chest-beating, and sometimes self-mutilation —pulling of the hair and laceration of the cheeks. The deceased’s corpse was then washed, anointed, and displayed on a funeral bed in the house before ultimately being transported to the tomb or site of cremation on an elaborate bier in a procession known as the pompa. For elite Romans, the pompa was a dynamic performance defined less by solemnity and more by a multi-dimensional performance designed to reflect and reinforce political and social status. These spectacles featured not only the nuclear and extended biological family but also clients, current slaves, former slaves, hired mourners paid to wail and sing dirges, and musicians playing horns, flutes, and trumpets. For elite Roman men specifically, the procession culminated in the Forum with a public eulogy attended by male family members who would wear the ancestor masks depicting deceased male relatives. 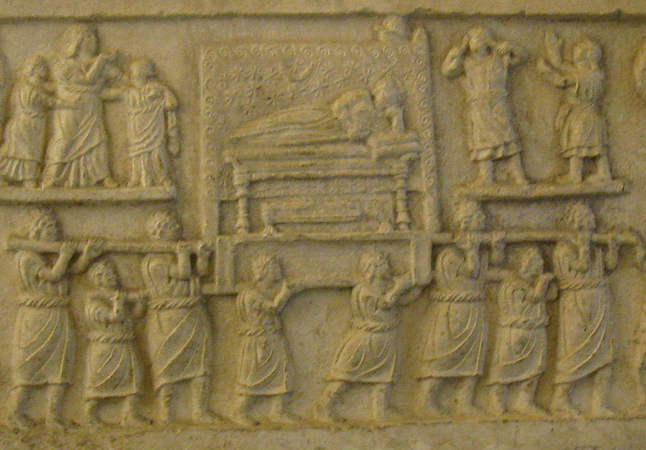 In the relief from Amiternum, the pompa scene shows a male figure, resting on an elaborate funerary couch and transported by eight pallbearers (above). Though dead, the figure appears still very much alive—tilted up on his left side and resting his head on his left hand. On either side of the central scene are all the elements of a funeral cortège. On the right pipe players, with hornblowers and a trumpeter on a floating ground line above. To the immediate right of the deceased are two women, perhaps hired mourners, one grabbing her hair and the other with her hands upraised. Most likely it is the chief mourners—the widow and children—who follow behind, to the left of the deceased. A partial inscription found near the relief suggests that the tomb was commissioned by a person whose family was formerly of servile origins. Stylistically, the relief exhibits many of the formal characteristics typical of ‘freedmen’ art, a category of art commissioned by former slaves (or descendants of slaves) and one which largely rejected the Classicizing trappings of elite roman art. Art commissioned by freedmen and women typically exhibits disproportion, hierarchies of scale, collapsing of space or ambiguous spatial relationships, and a gestural use of line. In subject matter, freedmen art is characterized by an acute focus on self-presentation, specifically expressions of social mobility. The pompa relief was part of an ensemble of reliefs—of which two remain—most likely inset into the fabric of a larger tomb complex that no longer survives. The other relief (above) depicts a scene of gladiatorial combat, an image type occasionally found on funerary monuments and usually understood as a reference to the public munificence of the deceased. Providing games or spectacles to the public was expected of magistrates and civil servants and such acts would be worthy of biographical commemoration. Though of servile families, freeborn men could and did rise to such offices. Considered together the two reliefs are mutually informing—displaying on the one hand, a spectacle for the public and, on the other, the spectacle of his death. As many ancient authors attest, the number of figures in a funeral procession directly correlated with the perceived importance of the deceased. While the patron of the Amiternum monument was not a member of the elite, patrician class, he certainly wanted to convey his importance by selecting two poignant images to document his biographical legacy—in recording public munificence during life and in expressing status in death. Another tomb featuring a recognizable funerary ritual is that of the Haterii, built around 100 C.E. Discovered piecemeal in Rome since the late 1800s, the original form and layout of the tomb is unknown but the ambition of its decoration and narrative scope is obvious from the series of reliefs and portrait busts that do remain. Constructed by a family of builders, the tomb simultaneously documents the death of the family matriarch and celebrates the family’s source of wealth. Though two busts remain of a male and female, it is the woman who appears multiple times in the visual program of the tomb’s reliefs. In the death scene, she appears on a funerary bed in the atrium of the house (above), surrounded by lit torches, a flute player at her feet, and her children beating their chests in mourning. Below the bed are three figures who wear the pileus, a cap of freedom worn by newly liberated slaves. This reference to the matron’s liberality and humanity is echoed both here with the figure reading her last will and testament beside her, as well as in another inset in which the deceased is shown making her will. The viewer sees a conflation of time, viewing the deceased both alive and dead. In the relief above, she is shown in a retrospective portrait lounging on a couch with her children playing below. Under this vignette (below), is a grandiose temple-tomb with a portrait of deceased in the pediment and portraits of her children along the sides. In front of the tomb is a treadwheel crane which most scholars think is a reference to the family’s construction business. The Haterii were likely involved in important building projects during the reign of the Flavian emperors (69-96 C.E. ), and another relief from the tomb probably documents some of their major projects in Rome including the Flavian Amphitheater (later known as the Colosseum) and the Arch of Titus. Whether all of the reliefs originally constituted a narrative sequence or not is debatable but what does get communicated is the considerable expenditure on this tomb and the biographical means by which it was created. Though amassing considerable wealth, the Haterii family was, nonetheless, of servile origin. Both the Amiternum relief and the Haterii tomb were commissioned by patrons outside of Roman elite society, a factor that had a huge impact on the style and narrative content of the monuments. Funerary art commissioned by the Roman elite almost never referenced commerce or sources of wealth though this was a driving goal for funerary art of the freedmen. Similarly, elite monuments do not document death rituals, though elites certainly observed them. The Amiternum relief and the Haterii tomb, however, rely on a narrative interplay between death ritual and biography. For these patrons, as for many freedmen and women, their final resting places provided an ideal opportunity for documenting ritual observance and, more importantly, for documenting their success in life and commerce. John Bodel, “Death on Display: Looking at Roman Funerals,” in The Art of Ancient Spectacle, edited by Bettina Bergmann and Christine Kondoleon, pp. 259-281 (New Haven: Yale University Press, 1999). 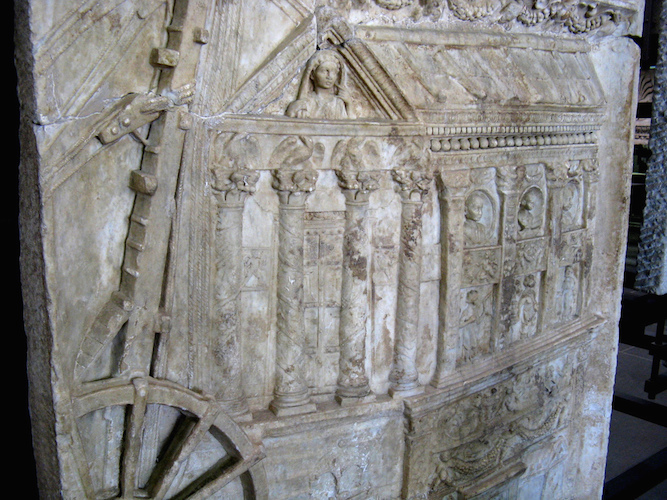 Diane Favro and Christopher Johanson, “Death in Motion: Funeral Processions in the Roman Forum,” Journal of the Society of Architectural Historians 69.1, 2010, pp. 12-37. Harriet I. Flower, Ancestor Masks and Aristocratic Power in Roman Culture (Oxford: Oxford University Press, 1996). Valerie M. Hope, Death in Ancient Rome: A Source Book (London: Routledge, 2007). Eleanor W. Leach, “Freedmen and Immortality in the Tomb of the Haterii,” in The Art of Citizens, Soldiers and Freedmen in the Roman World, edited by E. D’Ambra and G. Metraux, 1-18. (Oxford: Archaeopress, 2006). J. M. C. Toynbee, Death and Burial in the Roman World (Ithaca: Cornell University Press, 1971). Cite this page as: Dr. Laurel Taylor, "Roman funeral rituals and social status: The Amiternum tomb and the tomb of the Haterii," in Smarthistory, August 8, 2015, accessed April 21, 2019, https://smarthistory.org/roman-funeral-rituals-and-social-status-the-amiternum-tomb-and-the-tomb-of-the-haterii/.